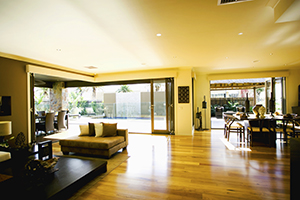 From floorboards, to walls, windows, doors and even facades - timber is a solid choice for almost any area of the home. The rise of timber popularity can be attributed to a number of reasons. Timber is a fantastic renewable source with a lower environmental impact to manufacture than many other comparable materials. Many suppliers use sustainable wood from cultivated tree farms that are an environmentally friendly option. Timber can also be re-used and reclaimed with minimal impact to the environment. It is also a great option for those wishing to blend their home into natural environments. Timber facades smoothly merge into green surroundings and can cleverly utilise trees and plants. Timber can also create striking displays both externally and internally. Minimising visual impact on the surrounding area, while maximising the visual impact inside the home allows timber to provide the best of both worlds. Timber is also a favourite material of many builders and designers. As a staple of the industry, people are very familiar with installation and maintenance requirements, which makes for an easy experience. Timber is extremely versatile and can be stained or painted in almost any style and colour to suit desires. Canterbury Timber Windows and Doors can be treated with TimGuard, an exclusive semi finished two coat clear seal, which protects and prepares timber for final stains and paints better than traditional treatment methods.